Struggling to get your daily serving of vegetables and looking for innovative ways to cook them? The days of serving up mushy boiled vegetables every night are long gone. There are so many ways to serve up your vegetables, but I believe one of the best is to roast them. Roasting seems to enhance their flavor. A tray of colorful, roasted vegetables, drizzled with a dash of olive oil and balsamic vinegar and sprinkled with fresh herbs simply cannot be beaten. 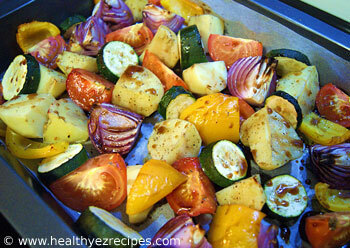 This roasted vegetable salad is good simple food at its best. The vegetables are the star of the show, everything else is just there to add to their flavor. So it goes without saying that the vegetables must be fresh and of good quality. With such a simple dish there is nowhere to hide. Great served with barbecued or grilled steak. Prepare your vegetables. They are going to be roasted so they don’t need to be finely chopped. Peel and cut the onions into quarters. Cut the courgettes or zucchini into thick slices. De-seed the bell peppers and cut into chunks. Quarter the tomatoes and peel and chop the potatoes into chunks. Preheat oven to 200ºC / 400°F. Get a shallow roasting tin and line with parchment paper. 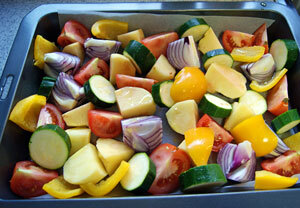 Place all the vegetables in the tin and drizzle over 2 tablespoons of olive oil. Season with salt and pepper. Shake the tray gently to coat the vegetables. Bake for 35 minutes or until vegetables are tender and lightly browned. When the vegetables are cooked remove from the oven and pour over the dressing. Toss gently until the vegetables are well coated. Add a few sprigs of rosemary and thyme. Combine all the dressing ingredients in a jar with a screw top lid. Give it a good shake to combine the oil and vinegar. There is no need to stick to the vegetables listed above. Why not mix it up. Use a firm potato variety so they hold their shape. New potatoes are ideal for this recipe.